THERE is mounting outrage in County Wicklow over plans to burn highly toxic chemicals in the Wicklow mountains. Wicklow Sinn Féin Councillor John Brady has called on Green Party Environment Minister John Gormley to halt the controversial plan. 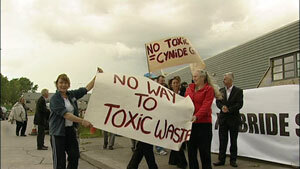 The huge concern in Wicklow and West Dublin at the plans to transport deadly hydrogen cyanide from Rentokil premises in Tallaght to Kilbride for incineration was seen in several protests over the past two weeks. As a result of the protests Sinn Féin’s John Brady was told on 20 June by a senior council official that incineration will be postponed pending a reassessment of the situation. But Brady says it is time for the government to intervene. Speaking during a protest at the Rentokill premises in Tallaght, Councillor Brady said, “The plan to transport and dispose of seven cylinders of this deadly chemical was kept secret from all elected representatives from Wicklow and South Dublin County Councils. “Environment Minister John Gormley has been aware of this plan for some time as it was his department which sought the use of the land in the Wicklow Mountains from the Department of Defence. “There is huge concern in Wicklow and West Dublin about the threat to local areas posed by these chemicals and the emissions from the incineration. A procedure like this has never been attempted before in Ireland. “The area where it is planned to incinerate the chemicals is close to the Shankill River which flows into Blessington lakes which in turn provides Dublin City with its drinking water. “There is a mixture of messages coming from different groups about the dangers of this project. People have been told that they will have to leave their homes at the time while other groups say that this is not necessary. There is an onus on the Department of Environment to clear up the confusion around this issue. “At a highly attended public meeting on Monday evening a plan of action was drawn up to oppose the plan to incinerate this gas. Members of the communities affected are quite determined to do all in their power to halt this plan including direct action where necessary. Protests against the cyanide incineration plans have been held in Killbride village, Ballymount and at the military camp in Killbride. A local committee has been established to put people’s concerns about the plans to South Dublin County Council.